From one point of view, badly. Very badly. The PDF is taken from a scan of the original booklet. The physical book was somewhat worn, the original text was weirdly typeset, and the scan isn't the highest quality. In terms of appearance and formatting, I produce higher quality first drafts for my publisher just by using a template and a word processor. Then there's the content. The organization...well, isn't. It meanders from one topic to another. And then you get to the actual words. It's clear when this was written and who wrote it. 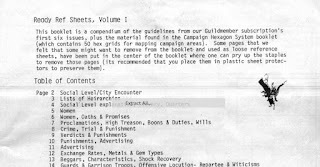 The first page of content contains a random encounter table divided into social circles. There are different columns for dealing with, for example, the nobility, merchants, the military, and so on. Each lists professions or positions: magistrate, apprentice, sergeant, etc. Fine so far. But one of the columns out of six has entries which are, literally, "woman." There's a rather peculiar woman sub-table to roll on at that point (on a 6, you encounter a woman who may be any number of things ranging from barmaid to goddess; what? ), and without going into further details, suffice it to say that a fuller treatment of "Women" (pp. 5-6) doesn't really improve matters. What does hold up, though, is a feeling of hidden depths. 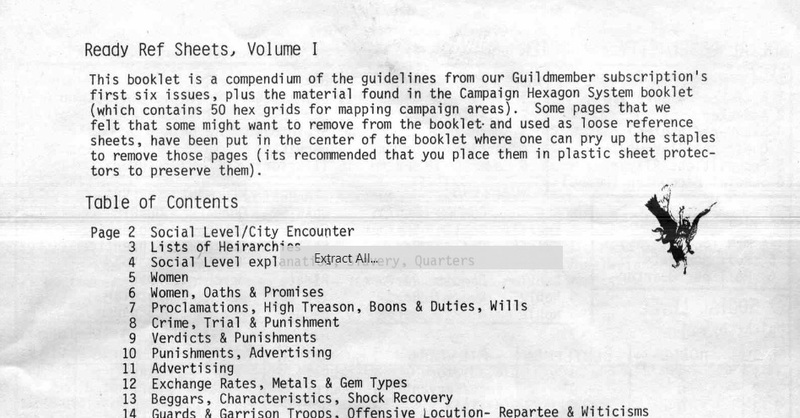 The book consists almost entirely of tables and charts: poisons and their effects, reasons for someone to attack the PCs, building costs and times, long lists of monster stats. It's detail upon detail upon detail, but it's devoid of any context. I happen to find that irresistible. It is, in its own way, like an ancient encyclopedia. It's a huge, disorganized jumble of facts and ideas which you know derive from a much larger whole, but they're not being held together in any kind of organizational framework. All of these tables imply a vast universe, but don't damage the illusion by explaining it. And that, ultimately, has become what I want out of my gaming world. The implication of detailed histories and complex relationship carries with it a charm not matched by clear exposition. It gives me a world where there's always something new. There's potentially a different adventure around every corner, with a never-ending abundance of wonders to unearth, gaps to fill, and novel experiences to have. So would I use it in a game I used these days? Maybe. Significant parts of it are useless to me. I'd probably take the basic ideas and radically expand them. But even if it's not the book I'd use now, it's the grandparent of GURPS Dungeon Fantasy 8: Treasure Tables and parts of GURPS Dungeon Fantasy Treasures 1: Glittering Prizes, and in many ways it's still the book that made me the gamer I am today. It has one of the few tables for generating the physical environs of a lair. After all these years, I can't believe that we're still waiting on a sequel for these tables.